The word scleroderma means “hard skin”. However, many people with scleroderma not only have problems with their skin but with other parts of their bodies as well. This is the reason why it has a second, explanatory name, “Systemic Sclerosis”. Scleroderma is an uncommon, chronic (persistent) disease. It affects the “connective tissues” which surround the joints, blood vessels and internal organs beneath the affected area of skin. Although there is no cure, proper treatment and care can make it possible for people with scleroderma to lead full, productive lives. This article presents some basic facts about Scleroderma. The better informed you are, the more able you will be to take an active part with your doctor and other health workers in keeping the illness under control. Localised scleroderma (sometimes called “morphoea”). In this condition changes only occur in the isolated areas of the skin and the tissues beneath it. It is relatively mild and does not affect internal organs. Systemic sclerosis. With this condition changes may occur in skin and also in many internal organs. These might include blood vessels, joints, digestive system (oesophagus, stomach and bowel), and occasionally the lungs, heart, kidneys and muscles. Changes in the connective tissue may affect the function of any of these organs. Scleroderma differs from person to person. It is hard to predict how the disease will develop in each individual. But it usually only affects a few pats of the body, and it often stabilises after a few year. People who have localised disease do not develop generalised scleroderma. Women are affected three to four times more often than men. The disease usually start in the prime of life, between the ages of 25 and 50. It is only occasionally seen in children and the elderly. The connective tissues cells of people who have scleroderma produce too much of a protein called collagen. Collagen is essential for holding the body together. Too little and we would fall apart, too much and the body becomes stiff and unable to function properly. The small blood vessels are also damaged in scleroderma. There may be a connection between the build up of excess collagen and blood vessel changes. The excess collagen is like scar tissue, it causes thickening and stiffening of those parts of the body it affects. The cause of scleroderma is unknown. It is not contagious and it is not inherited or directly passed on from one generation tot the next. However, as is the case with many other diseases, some families seem more likely to get it than others. The immune system may be important in causing collagen to be deposited. It occasionally seems to be triggered off by some unusual chemical exposure. Scleroderma is probably caused by a combination of different genetic and environmental factors. Researchers are busy trying to find out more about them. How it starts and What takes place? An early symptom of scleroderma is an extreme sensitivity to cold, called Raynaud’s phenomenon. In Raynaud’s phenomenon the blood vessels constrict or narrow. Sometimes all it takes to trigger off this response is for the person to walk into a cold room or to reach into the refrigerator. The narrowing of the blood vessels causes the blood supply to be greatly reduced; fingers and toes turn white and blue. Often numbness and tingling are felt in fingers and toes. When the blood vessels open again blood starts to flow, the skin colour returns to normal and the hands become warm. Most people with Raynaud’s do not get scleroderma, but most of those with scleroderma have Raynaud’s at some stage in their illness. Another common early symptom of scleroderma is swelling of the hands and feet, especially in the morning. The skin of the fingers and toes may look and feel swollen. It might get shiny and the usual skin creases may disappear. The facial skin may seem stiff. About 95% of people who have scleroderma have some thickening and hardening of the skin, especially of the hands, arms and face. Finger ulcers sometimes occur as a result of the narrowing of the small blood vessels. Some people will also develop small, white calcium deposits in various parts of the body. Scleroderma can also cause inflammation of the joints. This may be accompanied by signs of pain, stiffness, swelling, warmth and tenderness. 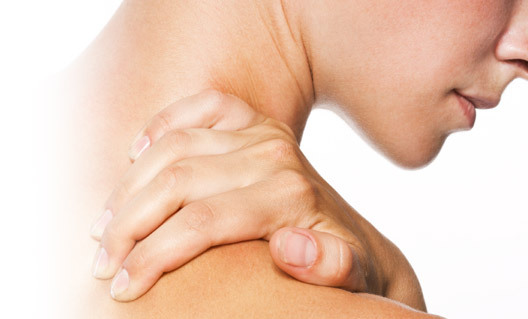 Muscle weakness is sometimes an early symptom of scleroderma. Contractures (when a joint tightens into a bent position) may occur due to the tightening of the skin and involvement of the tissues surrounding the joints. These may take place in the fingers and elsewhere in the body. The disease may also affect the connective tissue of the internal organs. For example, if the digestive system is involved, the muscles in the oesophagus (the tube which leads from your mouth to your stomach) may become weak. Swallowing is affected so that it is difficult to get food down into the stomach. Heartburn can be a frequent problem. Sometimes the middle and lower bowel is affected and bowel function is disturbed. The lungs, heart and kidney are occasionally involved in scleroderma. Your doctor will be on the lookout for high blood pressure. This my indicate kidney problems. Scleroderma is a variable, slow, chronic disorder. It usually starts slowly, gradually gets worse over a few years and then stabilises. Sometimes it goes faster. Occasionally it seems to cure itself. Its severity and effects are extremely variable. However, severe disabi-lity is rare. There is no single test for scleroderma. Laboratory tests and other studies may be needed to help determine if you have scleroderma, and what parts of the body are affected. In severe cases tests may need to be repeated at regular intervals. Tests might include blood samples, X-rays, breathing tests and a skin biopsy (a small piece of skin is removed and examined under a microscope). Scleroderma is a complicated disease, and differs in its effects on different people. Therefore, it my be necessary for the doctor to see you regularly. If you are severely affected, you may have to spend some time in hospital while tests are performed and special treatment given. There is no wonder drug or miracle cure for scleroderma. Treatment consists of exercise, care of the skin, and various drugs to help control the condition or treat complications. 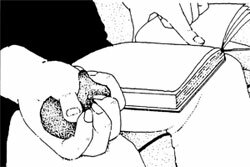 Squeeze a small rubber ball to keep the hands supple. This can be done when sitting relaxing. 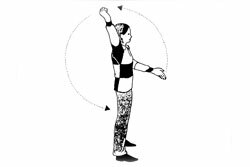 Swing the arms briskly through a full circle – repeat this about six or eight times. An exercise programme is one of the mot important activities in minimising the effects of the disease. Regular exercise helps keep the skin flexible, reduces contractures of the fingers and keeps the blood flowing freely. A variety of gentle exercise is required to keep the affected joints moving. The only time that rest helps is if joints become inflamed. Lightweight splints sometimes help provide temporary protection to joints, or help reduce contractures. The physiotherapist and occupational therapists can help teach you an exercise programme and advise on the best ways of protecting your skin and joints. 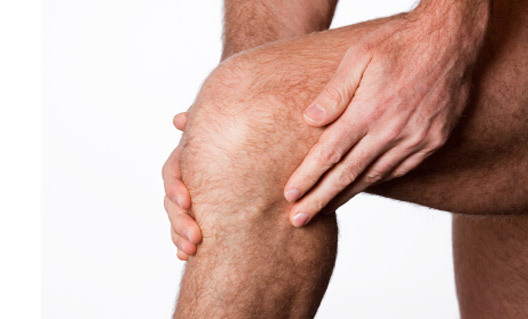 If your joints are not functioning properly, there are many ways in which they can help these as well. The aim is to keep a good supply of blood flowing to the skin and to protect it from cracking, peeling and ulcerating. Keeping warm from top to toe helps open the blood vessels to the arms, hands, legs and feet; these are often the coldest parts in chilly weather. Remember to wear a hat, as a great deal of body heat is lost from an uncovered head. You might consider thermal clothing, hand warmers, electrically-heated gloves and socks. In order to keep the skin as supple as possible, avoid using strong detergents or other substances that irritate your skin. Many brands of soap, creams and bath oils are designed to prevent dry skin. Try some of these until you find the ones that give you the best results. If you smoke, it is likely that you would be helped by stopping, as smoking reduces the blood flow to your skin. Remember, some drugs work for some people and not for others. So what someone else is taking may not be right for you. To treat Reynaud’s phenomenon, drugs that cause the blood vessels to dilate or become larger are prescribed. There are several of these. They may be given by mouth, applied to the skin or injected into a vein. To soften the skin, several anti-fibrotic or anti-collagen drugs may be tried, but they do not always produce a great deal of benefit. To prevent heartburn the doctor may recommend antacids, or a drug to lower the production of acid in the stomach. If your joints are inflamed, a number of different drugs may be used to relieve pain and reduce inflammation. Aspirin and the non-steroidal anti-inflammatory drugs might be used in this case. High blood pressure sometimes occurs, but may cause no visible signs. It needs treating to prevent problems later. Several drugs are available to control your blood pressure. Steroids, which are synthetic forms of a hormone (cortisone) that occurs naturally in the body, also reduce pain and inflammation. These are sometimes used (sparingly) at various stages of the disease. They might be employed, for example, at the early puffy stage, or if there is muscle or lung involvement. There may be emotional and social difficulties connected with having a chronic disease. There may be times when you feel overwhelmed by the problems. In addition, stress can affect the disease, particularly Raynaud’s phenomenon, because it reduces blood flow to some parts of the body. So it is important to try to avoid undue tension. Do try and talk out any problems or feelings of stress you may have with your family and friends. If you need help in handling stress or depression, your doctor may be able to refer you to a social worker or counsellor. There is no evidence that diet either causes, or has much effect on, scleroderma. However, the disease can cause you to lose weight and some people have trouble with swallowing or with heartburn. Aim at having balanced meals and try to stay at your normal weight. If you have trouble swallowing you should eat slowly and chew thoroughly. Drinking water or some other liquid will soften food. Eating several small meals is also a good idea. If you are having problems with eating, try six small meals a day rather than three large ones. Antacids can give you “between meals” relief from heartburn. If possible, try to have your largest meal in the middle of the day rather than close to bedtime. Another suggestion for heartburn sufferers is to raise the head of your bed by putting six inch blocks (or telephone directories!) under that end. In this way, gravity will keep acid from washing back from your stomach up into your oesophagus while you sleep. Most people with this illness are still able to lead rewarding lives. There is a good chance that you will be able to keep up with most of your normal activities. Many things can be done to alleviate the disease. While most are not dramatic, they can often make the difference between continuing a stable, well adjusted and active life or becoming disabled. Most important is your own determination not to let it get the best of you, together with a common sense approach to treatment. Scientific exploration into the causes, treatment, and possible cure of scleroderma is being conducted at many centres throughout the world. If you have difficulty opening child-resistant closures, you can ask the pharmacist to dispense your drugs in a more suitable container.